I haven't used anything new for my skin lately except for the Shiseido Ibuki duo that broke me out badly. Now that my skin cleared up and has recovered from the post-inflammatory hyperpigmentation from fractional CO2 laser therapy, I'm ready for new skintastic treats before the month ends. I'm thrilled to learn that Proudly Filipino brand Camaru Naturals' has come up with a face mask that contains the very ingredient that makes my fave bar soap from the brand tick, activated bamboo charcoal! Their soap brightens the skin on my body and I can't wait to see how it fares for the face. And it still feels surreal I'm looking at skincare from Paula's Choice. I'm very excited to find out which of these four my skin will love best! whoa! i'm intrigued! but i think i still have to heal my acne and its scars before jumping to these babies.. 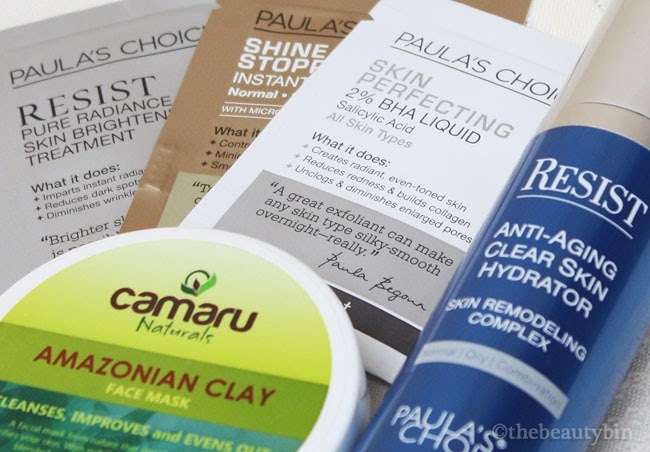 I hope you can review the resist product from paula's choice! I got their moisturizer and it's amazing!